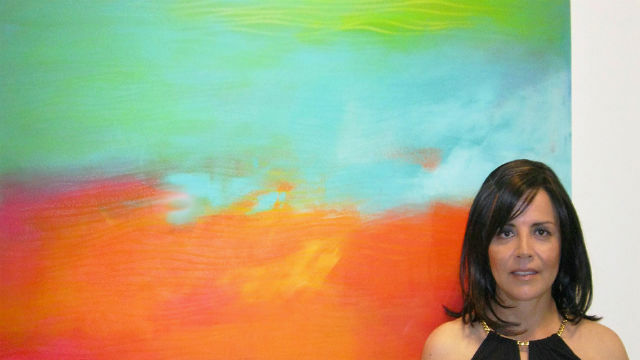 Tania Alcala with one of her paintings. Tania Alcala says that to her colors are living beings that call to her. She sets the paints out in front of her and lets each color tell her which one to use next. She feels that her spirit guides her in painting and the energy is portrayed in her creations. One can certainly feel that energy when gazing at her colorful paintings. Right now, two of her paintings are part of the “Women’s Work” exhibit at the RB Stevenson Gallery in La Jolla. The exhibit opened Saturday and runs through Oct. 17. Her bright paintings really catch the eye. Alcala has had an unusual life. Born in Mexico City, she left in 1981 to get away from what she viewed as an oppressive society, especially to women. Driven by a natural curiosity and a desire to explore, she arrived in the Bay Area and pursued a masters degree in art from John F. Kennedy University in Berkeley. She started out as a realist painter, but the art scene in the San Francisco area opened her eyes to abstract painting, and she has focused on abstract work ever since. At the age of 35, she decided to study flying and became a commercial pilot. She worked for ten years as a pilot, flying a private jet for a real estate magnate as well as DC-9 cargo planes. Today, she still flies part-time, but is mostly devoted to her art as her success has grown. She feels that art is her calling in life, and wants to share that calling with others. The gallery at 7661 Girard Ave. is open Tuesday through Saturday from 10 a.m. to 5 p.m.
Mimi Pollack is an English-as-a-second-language teacher at Grossmont College and a freelance writer.